Davanti is a great neighborhood Italian eatery attracting people from all over Chicago. They focus on sharing plates... some are to die for and others are good, but not too memorable. Honestly, they have two of my all time favorite dishes, ones that make me return to their restaurant. The atmosphere is classy, but at the same time fun... there are tons of people hanging out at the bar and the dress attire ranges from shorts and a t-shirt to jet black suits. I find it a great place to come with large groups mainly because the sharing aspect is always better with more mouths to feed. Unfortunately, Davanti doesn't take reservations, making it difficult to dine on some days, especially if you are on a time constraint. So make sure you allow plenty of time if you plan on eating here... and I suggest you plan soon! Without question, this is my favorite appetizer I have ever eaten!!! I crave it constantly and absolutely dread running out of it whenever I dine at Davanti. It is such a simple appetizer that packs so much taste and richness that it will make you come back time and time again. 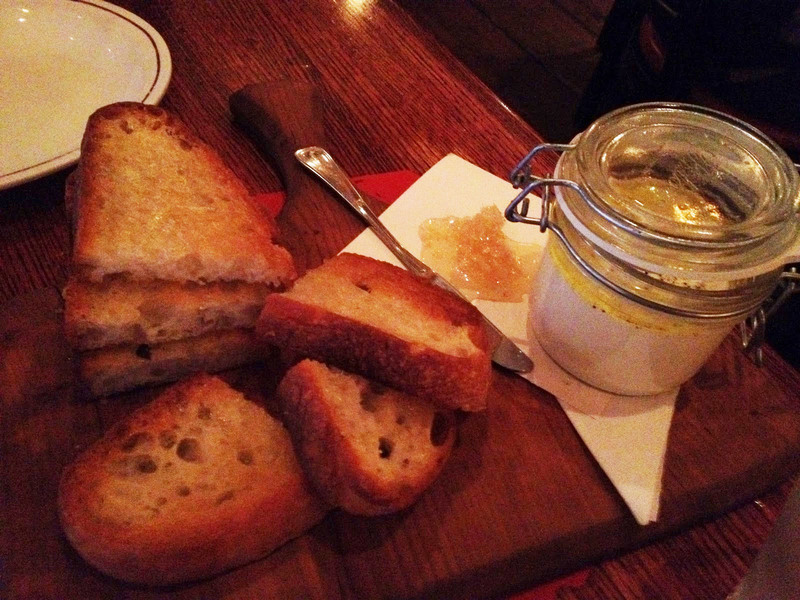 The name of the dish says it all... fresh ricotta cheese served in a jar with a little honey drizzled on top and a chunk of fresh honeycomb on the side. It comes with about 6 pieces of toasted tuscan toast (I wish it had more)... Make sure to spread a lot of ricotta, a little of the honey, and a nice small piece of the honeycomb on each piece of toast. It is unbelievable! This may be one of my favorite small plates or even entrees in all of Chicago. They always keep you guessing on the polenta... "Will there be any left when I get there?" and "What will the ragu be today?" are just a couple of the questions that I wonder after I decide on dining at Davanti. Anyway, this day my friend and I arrived early enough to get the polenta. We ordered the small (which is plenty for 2-4 people), especially if you are ordering a lot of other dishes. They arrive at your table with a small cutting board, a pot of polenta, and a pot of the ragu. They pour the polenta and then the ragu on top. 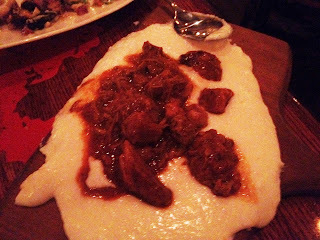 The pork shoulder was extremely tender, the sauce was savory, and the polenta was rich and creamy. Eat it quickly because it tastes so much better when warm. I wish there was a way to keep it warmer for a longer period of time. I tend to be a sucker for anything that says truffle. And when I recently watched a show that featured truffle egg toast dishes. I had to try it. It was a thick cut piece of bread with a little divot carved into it. The egg cooked sunny side up was carefully placed in the divot and it was served with of course truffles and a fontina cheese. The entire piece of toast was served on top of a bed of lightly seasoned asparagus. The dish was simple, yet packed with flavors. The truffle wasn't too strong, so it didn't overpower the other components. 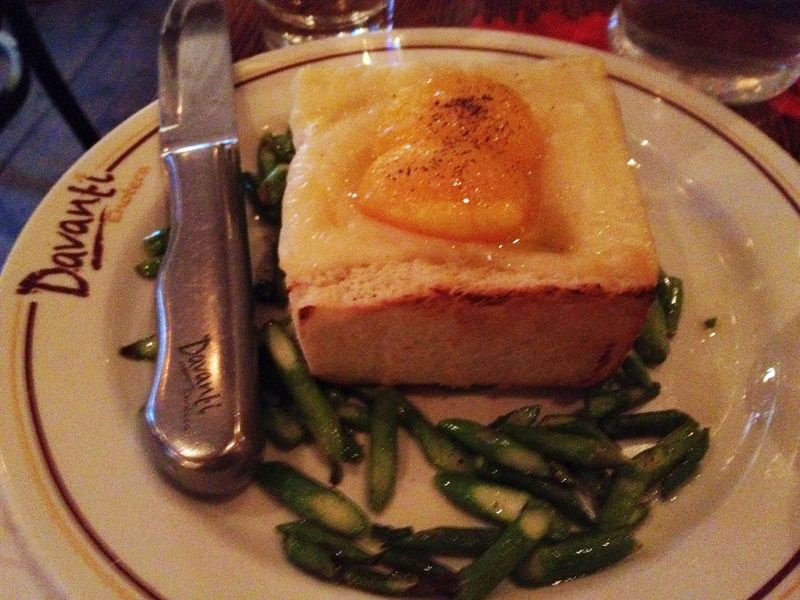 The egg yolk was rich and the asparagus gave a nice freshness. I enjoyed the dish, but overall, it wasn't that special. The dish gets cold real fast, and once it does, it is not that pleasant to eat. Everything dries up and becomes almost crusty. I was hoping this octopus dish was going to be better than it actually was. 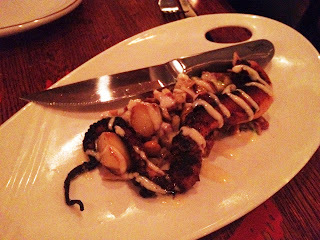 My friend and I enjoy octopus, but for some reason at the end of the meal, each of us didn't really want to finish the dish. It was a simple preparation... seared octopus with a warm potato salad, marcona almonds, and a horseradish aioli. I honestly can't remember eating almonds or the aioli. That just tells you how "memorable" it actually was... which was not very. The potato salad was pretty good. The octopus definitely shined of all the components, but I probably wouldn't get it again. So I heard of this sorbet from one of my friends... They offered it at Taylor Street Festival. Once I heard blood orange, I knew I had to try it and had to bring one of my friends. We were so disappointed when it first arrived... the waitress brought us peach. Finally, after a little bit of a wait, the blood orange sorbet arrived and it was better than expected. The color was incredible and the flavor was definitely blood orange. The order comes with two small scoops which is definitely not enough. I can easily say it was one of the best I have ever tasted. 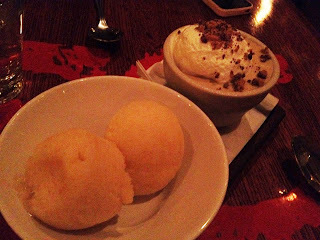 The waitress accidentally brought us the peach sorbet at first, and after noticing her mistake, she let us keep this sorbet and also brought out the blood orange flavor I wrote about above. This flavor was sort of dull; the peach was definitely there, but after trying the other desserts, you could tell the flavor was just not as strong. It reminded me of a sweet palate cleansing dish as opposed to a dessert. I wouldn't recommend this sorbet unless sweet desserts aren't your favorite. This dessert is hard to explain. It was extremely simple... a butterscotch pudding topped with whipped cream and butterscotch crumbles. It was way sweeter and more rich than the two types of sorbet we tried. It was nice having both the sorbet and this pudding, but if I had to choose... I would easily choose the Blood Orange Sorbet. - You have to either show up earlier or be prepared to wait. They don't take reservations so its first come, first serve. Drinking by the bar is encouraged and definitely fun. - Do share everything! I saw a couple eating next to us... and they were ordering their own small plates. The concept of the restaurant is to share! - Do order the Ricotta and Honeycomb as well as the polenta. You will not be disappointed. I promise! - Do ask for their specials... We were lucky enough to get a martini special for $5. They were a perfect way to start out dinner! - I wouldn't drive... parking on Taylor St. can be difficult unless you wait to valet park. If you do drive, then free parking is available on Roosevelt Rd. (Between Racine and Ashland)... you may have to walk a little bit so the closer you park to Loomis the better.